There’s several online stores that let you buy all the items they have in stock for a fixed price (say, a fiver or a tenner), but there’s not that many that sell eyewear only. And that’s what 25DollarEyeglasses.com is all about. 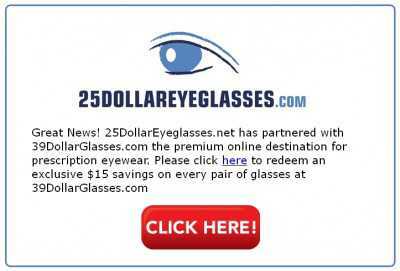 As its name says, 25 Dollar Eyeglasses is a site where you can buy glasses for as little as $25. This company has got a really large catalog, and it sells everything from fashionable glasses and sunglasses, to prescription lenses for men, women and children. You can browse through all the available frames using a quick navigation menu that lets you choose the model that you want, and then change its color until you have found the perfect combination. And features like anti-reflective coating are also available at a price. 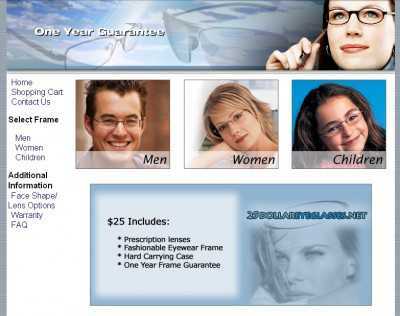 Besides, 25DollarEyeglasses.com sells items like hard carrying cases and lens cloths. You can add them to your shopping cart, and have them shipped as part of your order. And if you visit the company’s website right now, you’ll see that it has recently partnered with 39DollarGlasses.com, and that it’s offering $15 vouchers for every pair of prescription glasses that you buy there.